After the end of the 50-year-long myth of Cold War in 1991, the Zionist Mafia needed a new enemy to replace Communism. What could be better than Muslims who hate West for blindly supporting the Zionist entity. On September 16, 2001, former US president George Bush used the term ‘War on Terrorism’ – coined by his Jew speech writers (Noam Neusner or David Frum) which the Jewish-owned media turned into War on Islam. Palestine-born German Jewish author, human rights activist and a renowned musician Elias Davidsson released his latest book, The Betrayal of India: Revisiting the 26/11 Evidence, in June 2017. The book is about series of terrorist attacks that occured in Mumbai on November 286, 2008. As usual, the governments in India, the US, Israel, and Judeo-Hindu press blamed Pakistan and Muslims for the attacks. 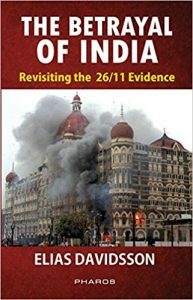 Davidsson accuses India’s major institutions such as government, military and intelligence agencies, police, Judiciary, press for suppressing the truth about Mumbai terrorist attacks on November 26, 2006. Furthermore, entities in the US and Israel also gained from the attack. The author could not find any benefits for the Pakistani government, military or businesses. The main profiteer seems the Hindu extremist constituencies (Hindutva) by the elimination of Hemant Karkare, who was on the verge of exposing Hindutva terrorist networks. Davidsson calls on the Indian Civil society to ask for the establishment of a National Truth Commission on 26/11 mandated to establish the facts on the attacks of 26 November 2008. The Civil society itself should demand the creation of an International Commission of Inquiry on the previous terrorist attacks under the authority of Chapter VII of the UN Charter, including those committed in the US on 11 September 2001. On November 14, 2015, Bruce O. Riedel posted a propaganda post at the Jewish Brookings Institute website claiming that the horrible Paris attack was modeled on 26/11 Mumbai terrorist attacks. In other words, the former CIA official was confirming that Israeli Mossad was involved in both terrorist attacks. Earlier Davidsson authored an investigative 2013 book, Hijacking America’s Mind on 9/11, debunking the official story of 19 Muslim hijackers. The book is based on Davidsson’s ten year research of terrorist activities in London, Turkey, France, Saudi Arabia, Germany, etc. to come to the conclusion that 9/11 was conceived and conducted by CIA, Mossad, FBI and the ZioCons in Bush administration. Former CIA agent, Robert David Steele has claimed that every terrorist attack in United States was a false flag operation. Canadian academic and 9/11 researcher, Dr. Graeme MacQeen has written an excellent review of the book. Davidsson’s parents immigrated to British occupied Palestine in late 1930s to escape Nazi persecution of Jews. He lived his first years in Baq’aa, a neighborhood of Jerusalem, where Jews, Christians and Muslims lived in peace side by side. These early years left a deep mark on him. Davidsson has lived in France, Germany, the United States, Iceland and Switzerland. He writes in German, English and French languages.